Let The Hermit from Tarot be your guide through this year. 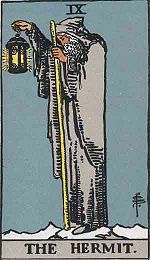 The Hermit is the ninth card of the Major Arcana, and 2016 resonates to the number Nine (2+0+1+6 = 9). For you personally, this year will resonate to your birth number because when we add Nine to any number, the original number remains. For example, my birth number is Seven, so 7+9 = 16 and 1+6 = 7. However, working closely with the number Nine and The Hermit will be very beneficial to you. Numerology says that nine is the number of completion, of connection to universal influences, and a willingness to let go of that which no longer serves us. As three times three, it leads to balance and inspiration. Nine also is the number of the humanitarian. For you, regardless of your year number, Nine will aid you in bringing circumstances to fruition, letting go of emotions, stuff and people, finding balance and inspiration, and serving others. The Hermit is one of my favorite keys in Tarot. In the traditional Waite-Rider deck (pictured), he stands on a mountaintop holding a guiding lantern. The mountain represents the summit of intellect and compassion. The Hermit has climbed the path to the top of the mountain through many trials of mind, body and spirit, and has committed to light the way for others. The lantern in his hand, called the Lamp of Truth, offers hope to those who are struggling through a “dark night of the soul.” His lantern’s light is a six-pointed star, also called the Seal of Solomon or the Star of David. The two inter-connected triangles also represent the coming together of masculine and feminine energies and the concept of “so above, so below,” describing our earth-bound connection to divinity. The Hermit, while acting as a beacon for others, also lives a solitary life. He isn’t lonely on the mountain, but rather uses his time there to contemplate spirit and his place in the completion of the tasks he was called to accomplish in this lifetime. Most important, The Hermit reminds us that if we follow the guiding light of truth and spirit, we too can reach the mountaintop of understanding and then carry the light for others. This is a year for each of us to work toward the goals set out on our path, numerologically, astrologically, spiritually, mentally and emotionally. However, it also is a year to remember the tasks set out by the year number Nine, and to be the light for ourselves and others.